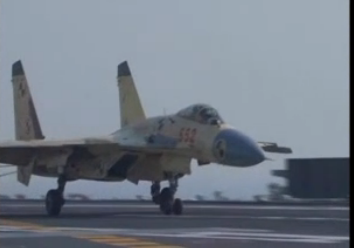 There were lot of cheers and clapping on Liaoning, China's first aircraft carrier, when a J-15 fighter jet landed on the carrier for the first time. The Chinese-made J-15 fighter landed on the 300m (990ft) former Soviet carrier during recent exercises, China's defence ministry said on Sunday. The Liaoning, China's first aircraft carrier, entered into service in September.